I’m not sure there is anything happier than being greeted by giant tulips and a smiling face! 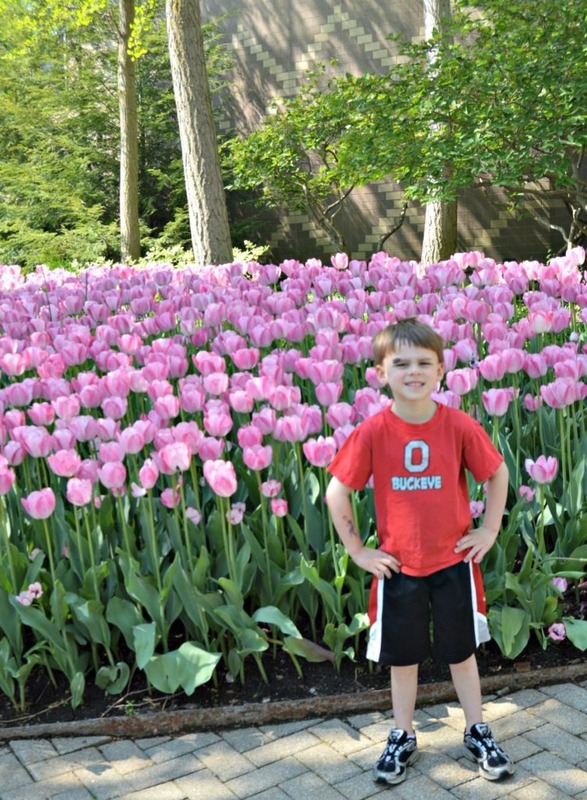 Our family recently took a trip to the Franklin Park Conservatory in Columbus, Ohio and that’s exactly what we experienced! Located just east of downtown Columbus, the land for Franklin Park was purchased in 1852. In 1884 the State Legislature opened the land for public use. Franklin Park and the Conservatory was the site of Ameriflora 1992 and because of that the buildings were renovated and expanded. I had been hoping to visit the Conservatory since I learned of their Blooms and Butterflies program. The boys and I studied butterflies a few months ago, and I knew this would be a way for them to see and experience what we had learned. It also helped when I learned via Facebook that the tulips were blooming throughout the campus. My mom is a florist, and I inherited her love for flowers (just not her green thumb)! The boys and I met up with my best friend from college and her 14 month-old little girl before entering the Conservatory. After paying for admission (currently $19/adults, $12/kids over 3), we were briefed about the dos and don’ts of the butterfly exhibit. This was definitely good for Jackson (5) to hear because we didn’t want him squishing any butterflies! The butterflies were beautiful and I wish I would have captured more photos for you! There were some school groups in attendance but it didn’t take away from our visit (just made us keep a better eye on our kiddos- Olen would have walked away with them when the teacher called)! This was before O escaped from the stroller. Too much to see to be locked in! 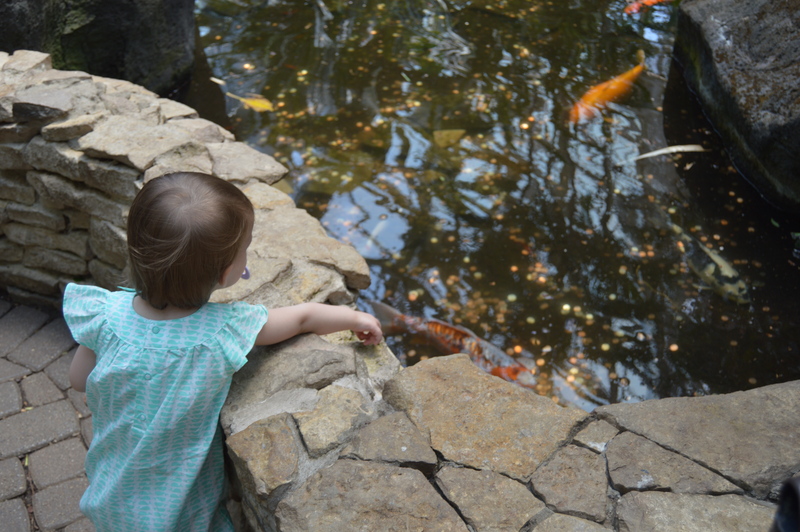 The koi pond inside the butterfly exhibit. Sis was in awe. 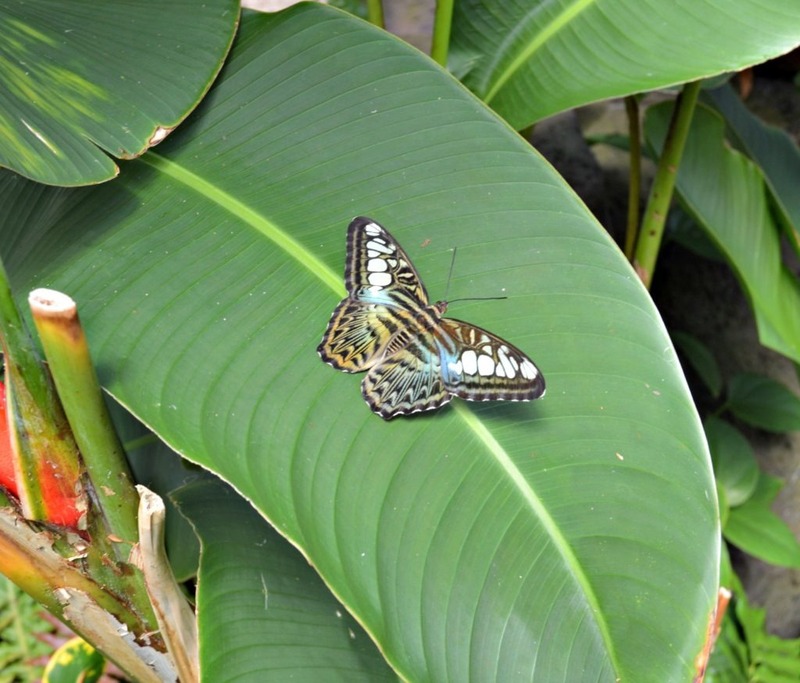 After exiting the butterfly exhibit, there is a children’s area where the kids can draw with chalk and learn more about butterflies. Even though it was simplistic, the kids had a blast. We also checked out the desert, Himalayan, and tropical environments before setting up our picnic. 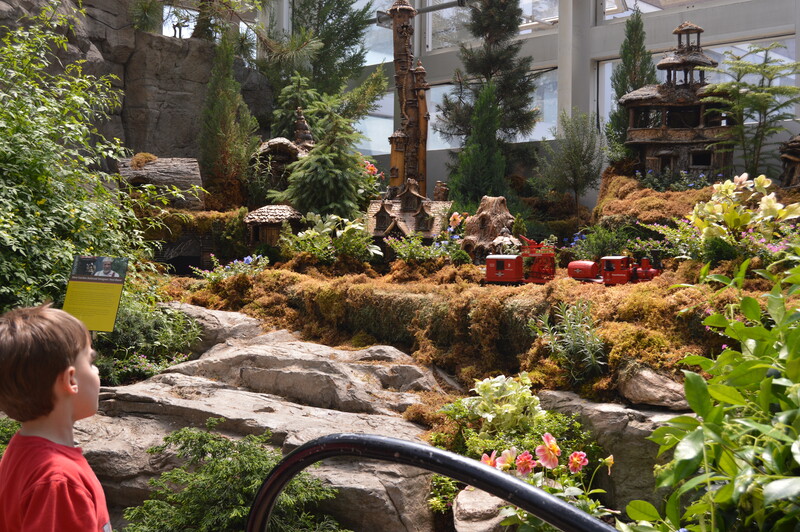 If you have a train enthusiast in your family, the Himalayan exhibit has a model train! The boys were impressed. The glass-blowing demonstration (i.e. Hot Shop) is outside but under cover. We didn’t spend much time there, but if your children are older they would probably think this was really neat! 1. The Conservatory is kept very warm. Obviously if you’re growing tropical flowers, you need the climate to be tropical. That said, dress lightly. This mama gets cranky when she’s hot, and no one likes a cranky mama! Lol. I plan to go back in February when it’s 20 degrees outside and I need sunshine and warmth! I think the Conservatory would cheer me right up! 2. While the Conservatory is handicap accessible, there are stairs throughout the exhibits. You will be able to get around just fine, you just may not be able to see things from differing perspectives. If you’re only traveling with one baby or older children, I would suggest ditching the stroller and trying to walk it. The space isn’t enormous! Also, there are not automatic doors between the exhibits and so holding the door propped while pushing my giant stroller through was a little annoying (first world problem, I know). 3. ^ That said, the bathrooms and elevators are big enough for a giant stroller- so take one if you must! 4. The Conservatory has a cafe on site, but there are picnic tables near the entrance. We packed our lunch and then my kids ran off any remaining energy at the playground. The playground is about 150 yards north of the front entrance. You can check out the full website for the Franklin Park Conservatory here. Have you been to the Conservatory before? Did you have a favorite exhibit? 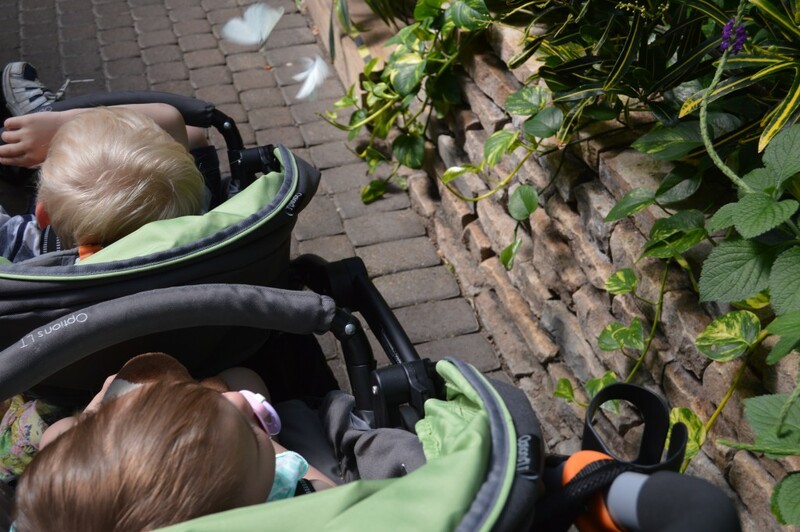 Maybe your kids were like mine and acted scared of the butterflies at first but then had a blast? **I have no working relationship with Franklin Park Conservatory. I just enjoyed a day out with my family and thought I would pass my thoughts onto you!